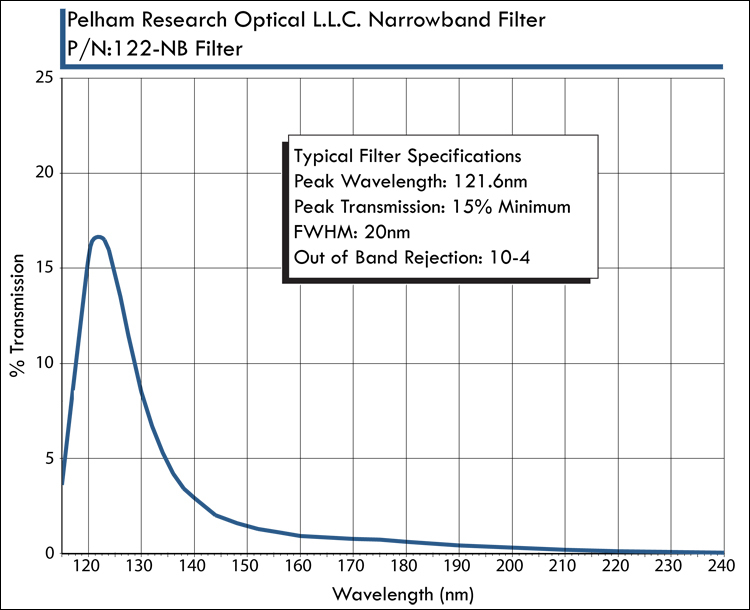 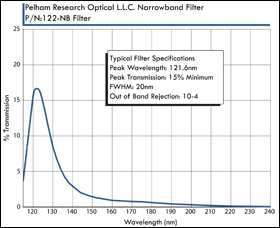 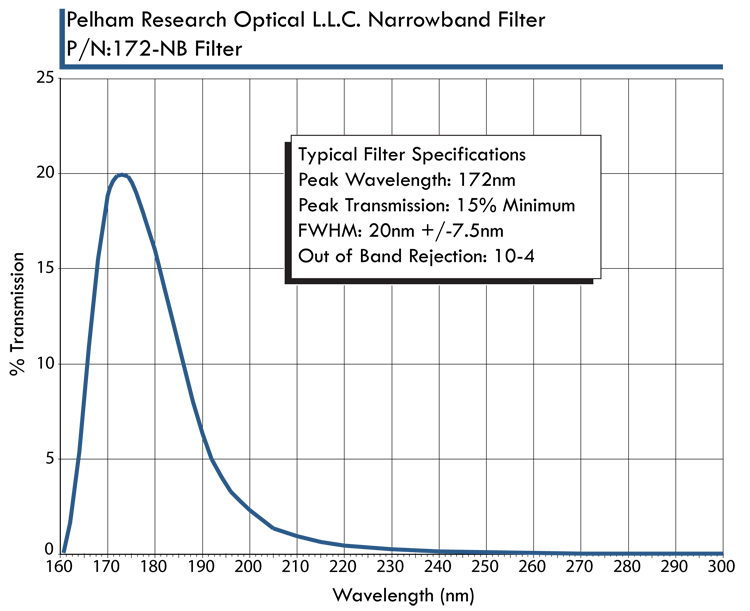 Pelham Research Optical (PRO) standard line of VUV-UV NARROWBAND (NB) optical filters have a typical bandwidth of ~20nm (FWHM) depending on the wavelength and a minimum transmission of 15%. 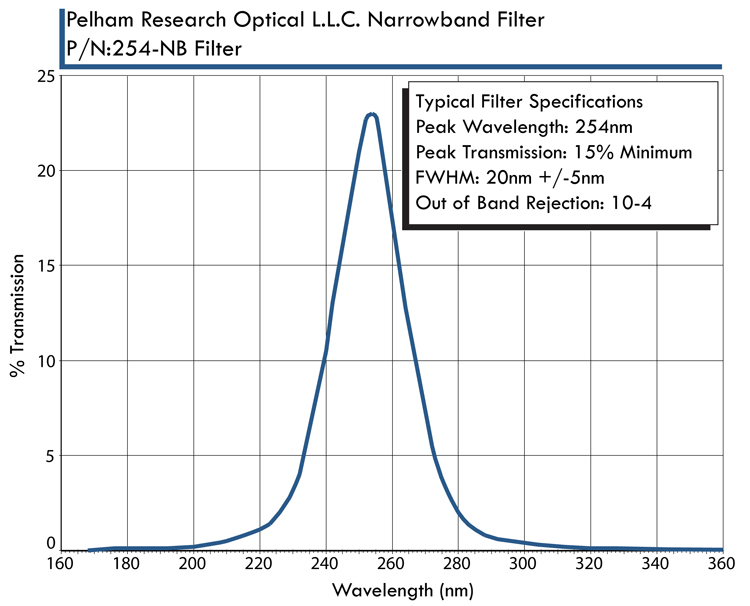 Visible rejection for PRO filter is typically 10-4 Coatings can be applied to Customer Supplied Material as well as supplied build-to print complete from your supplied drawings. 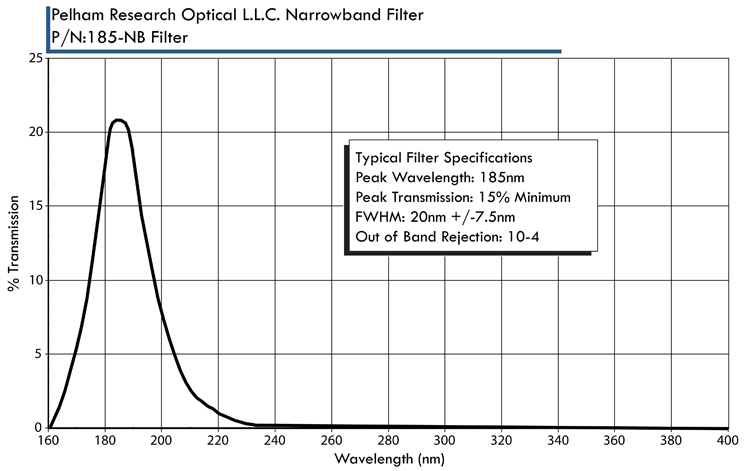 Narrowband (BB) filters from 122nm to 161nm are manufactured on high purity VUV grade MgF2, CaF2, and cultured quartz substrates. 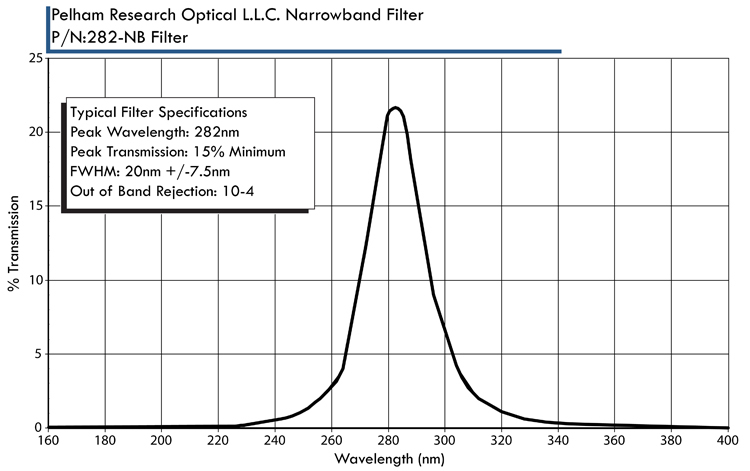 Filters from 170nm to 320nm are manufactured on UV grade fused silica and can be covered and edge sealed for added protection. 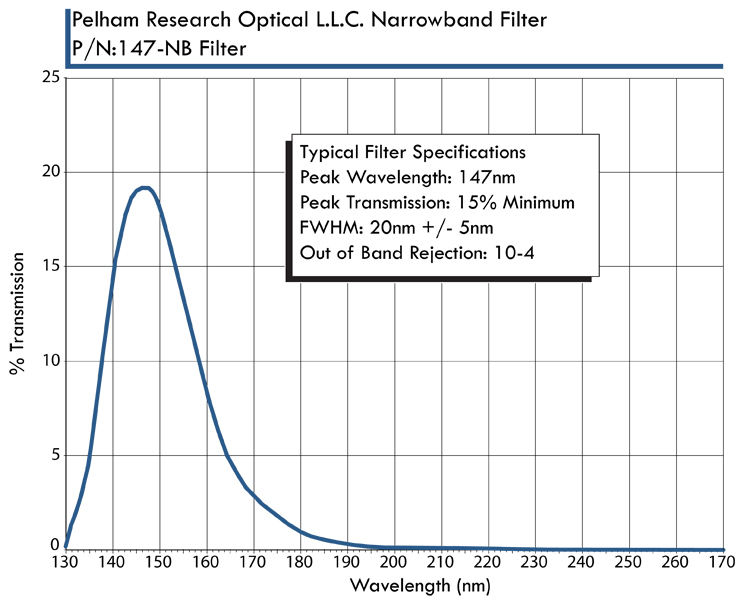 Please see our covered and edge sealed datasheet for more information. 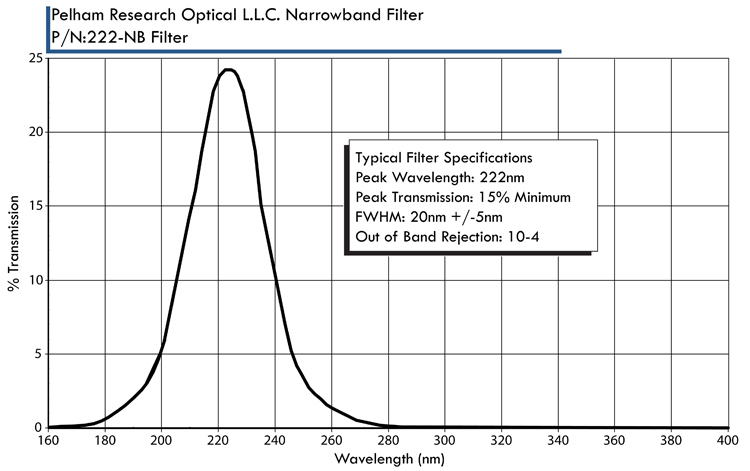 VUV-UV Narrowband (BB) filter applications: Astronomy, Analytical and Biotechnology Instrumentation, Element Analysis, Environmental Monitoring and Filter based Spectroscopy. 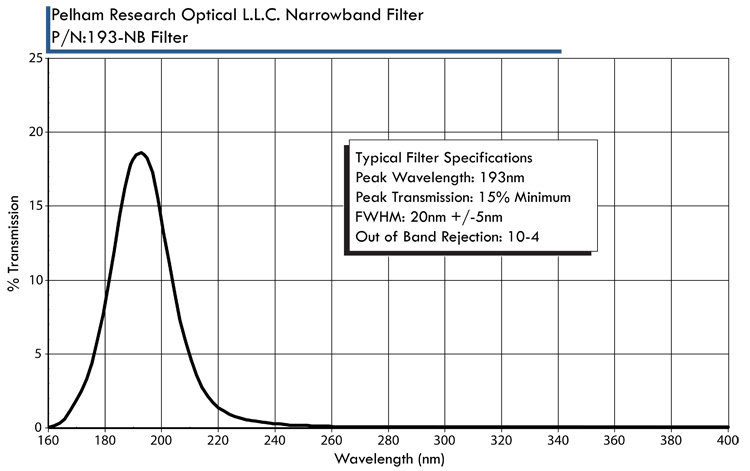 Analytical and laser line narrowband filters include 122nm Lyman line, 155nm carbon IV(C IV) line, 158nm Fluorine (F) line, 172nm Xenon (XE) line, 184.9nm Mercury (hg) line, 193nm Argon Fluoride (ArF) laser line, 214nm Zinc (Zn) line, 222nm (KrCl) laser line, 248nm (KrF) laser line, 253.7nm Mercury (Hg) line, 282nm (XeBr) laser line, 296.7nm Mercury (Hg) line and 313nm Mercury (Hg) line.